This morning, my Nexus 5 chirped with a notification I hadn't seen before. 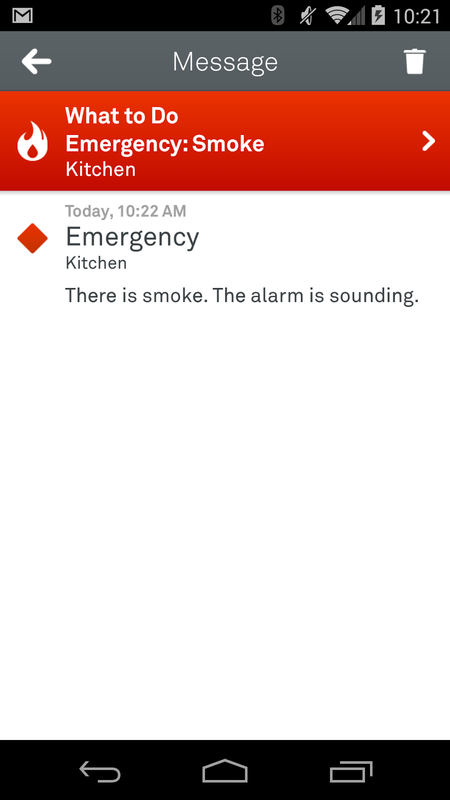 While I was at the office, my Nest application was telling me, in no uncertain terms, that there was an Emergency in the kitchen at home. 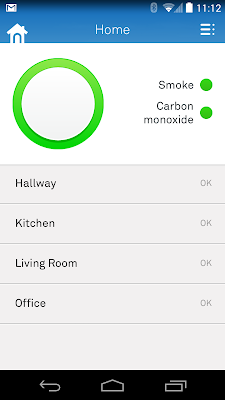 There was smoke, and the alarm from our Nest Protect smoke alarm was sounding. I called home quickly, and my wife told me, embarrassed, there was simply a small issue with the microwave, and all was fine. While getting alerted to something you can't immediately do something about is no doubt unsettling, it's also reassuring - especially when you consider the alternative (and status quo) is to not be notified until you come home and your house is ash. 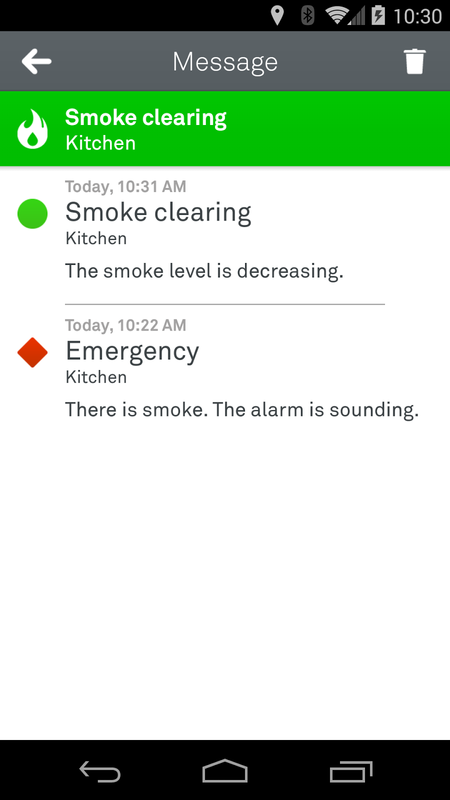 The Nest Protect alarm correctly detected smoke, communicated (in English) what the problem was, and notified me immediately on a device I always have with me. And as my wife confirmed, the device was being quite direct with her. 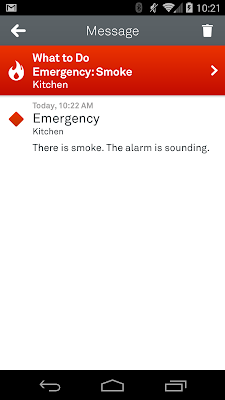 "There's smoke in the kitchen," was the message from all our devices around the house. Prior to Google's acquisition of Nest in January, I had purchased four Nest Protect smoke alarms in December, to start an upgrade that felt long overdue. As is recommended by code, our home has smoke detectors in just about every room, and their ancient look and behavior, matched only by their limited abilities and nuisances when functioning, give us something of a love/hate relationship. Their every noisy chirp when batteries ran low had us racing from corner to corner in the house, trying to track down the decaying device, and their overreactions to burnt toast or anything else had us all too eager to leave them simply disconnected - which was no good. So I was more than happy to take down four of the dusty beige models with no personality and start putting Protects in their place. With a little setup, each of the new devices connected, by Wifi, to one another, and they now hang quietly in our major traffic areas, waiting for any hint of trouble. And one perk, which few talk about, is the Protects' ability to function as a nightlight - providing illumination in near darkness, invaluable for the quiet tiptoeing in the hallways, past sleeping children at night. Adding the Protects to our home in December seemed like a logical move after getting the Thermostat last year. 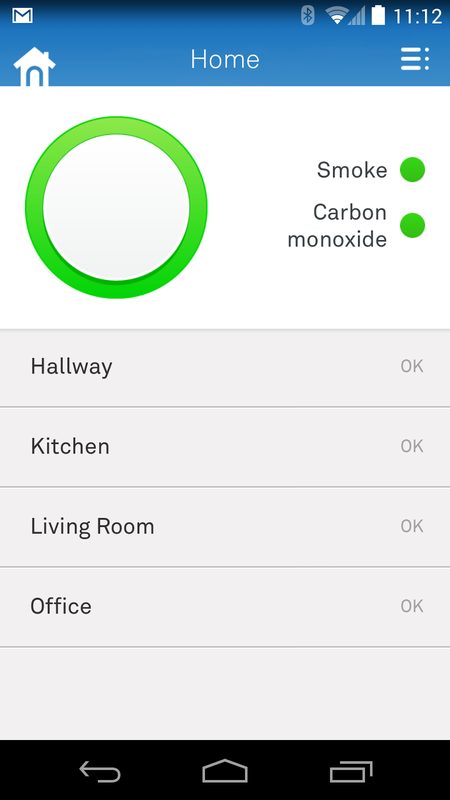 And while they don't see as much activity as the Thermostat, which is constantly keeping our temperature in check, it's comforting to see their current status in the app, and know that all is well. Today's "Emergency" was quickly resolved, and I got another update. There's not much to be excited about when it comes to the world of smoke detectors. But as Nest said when they first introduced the Protect series of smoke alarms, "Safety shouldn't be annoying." Too often, people end up in the same situation we had been, where the alarms in their homes were sitting to the side, with batteries out, or batteries had simply gone out and were useless shells - doing nothing to ensure the safety of the people who needed them to work. Like Sonos, you can view the status and manage any of the devices by name - usually tied to their location. 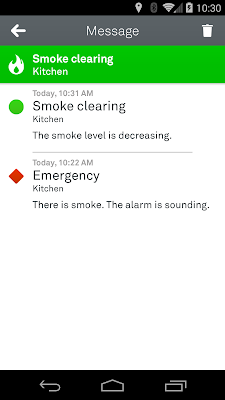 As we placed Protects in my electronics-heavy office, the hallway between my kids' bedrooms, the kitchen and our living room, it's easy to know which device is following status of each location, and in times of assumed crisis, they work in concert to let you know an action has to be taken. There's really two ways to do smoke alarms: The old way and the Nest way. Every older smoke alarm in my home is now assumed to be a liability, waiting for its time to be replaced. They don't talk my language, they don't look good, and they aren't equipped for this gadget-centric age. I've never gotten a notification from my older alarms, and I never will. Today's alert - even if it was a small one - confirmed that going with Nest was a good idea. And whether you think I'm biased because I work at Google, and can now count the Nest team as colleagues, consider I paid full retail for these devices (including the thermostat), and did so without any knowledge of an impending buy. That they're now working on our team is actually pretty cool. It's always good to have smart software impact my life. Disclosures: Nest, as mentioned, is a subsidiary of Google, where I work. I purchased the devices prior to the acquisition, and haven't gotten any kind of discount or any favors for being on the same team now. I just have a bias in favor of products that work well. Data makes you smarter, and can make you improve your behavior. The more we learn about how what we consume impacts our bodies, how exercise can help you lose weight, and how smart energy use can reduce costs and be helpful for the environment, improves all our life decisions. 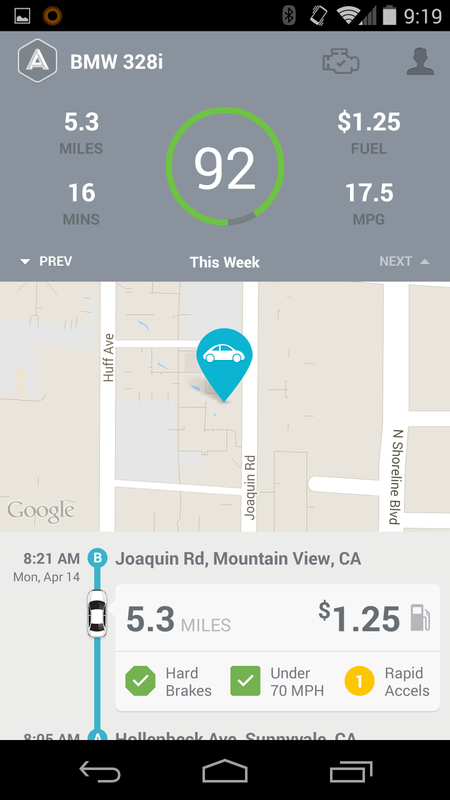 I've been a staunch Fitbit fanatic for about two years now, quickly brought Nest and Sunrun into my home to reduce our energy demands, and am now sporting a new device in my car that tracks my speed and acceleration, to help me save money on gas and be more efficient overall. The app's name is Automatic - which I first talked about back in May, but only finally received a week or two ago, when they completed the first rollout of their app on the Android platform. 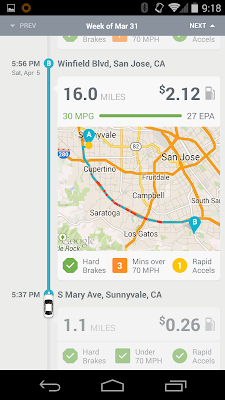 And now, every single time I drive my car, no matter where I'm going, the app (and the dongle which attaches by Bluetooth to keep things updated) are watching and alerting me to when I make any moves that aren't perfect. Setting up Automatic was, as you would expect, very easy. 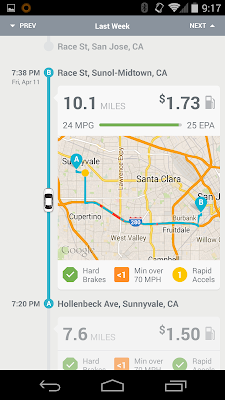 I unpacked the device, plugged it into my car's on-board computer, connected it to my phone through their dedicated app, and was good to go. 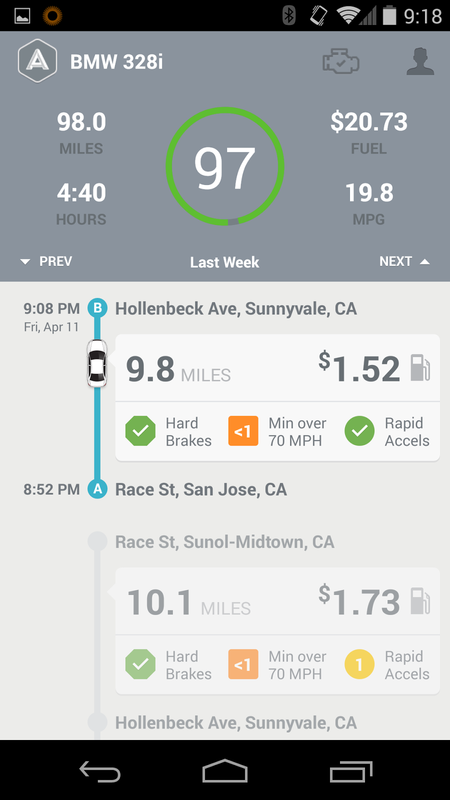 The pairing tracks every trip, including distance, speed and estimated miles per gallon, and uses that data to provide an estimated cost of the trip and an overall score, starting with 100 for driving perfection, and deducting any time I step out of line. 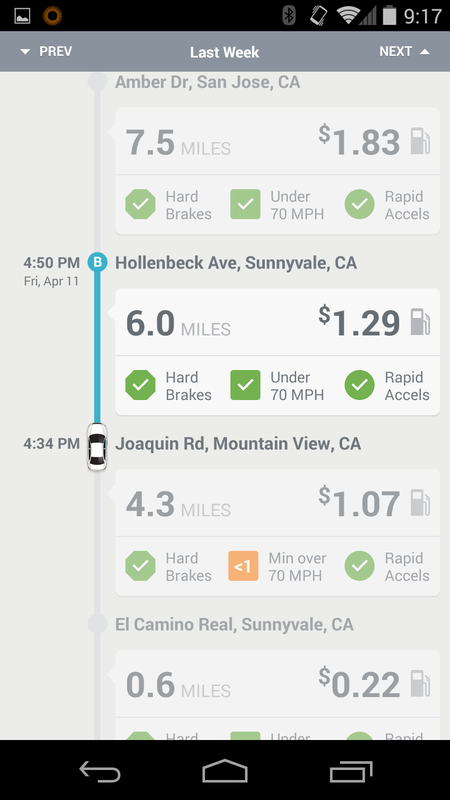 Automatic's assumptions for what makes for bad driving are simple as well. 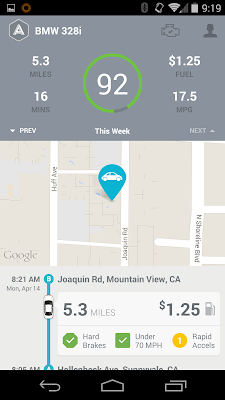 It's assumed that if you are driving over 70 miles an hour, that you're using more fuel than you should. So every time I get out on open highway in my BMW, capable of doing much more than 70, and I hit that mark, the Automatic device makes a chirping sound, telling me to slow down. If I stay above 70 for a sustained amount of time, the alerts continue and seemingly change tenor to be more dramatic. 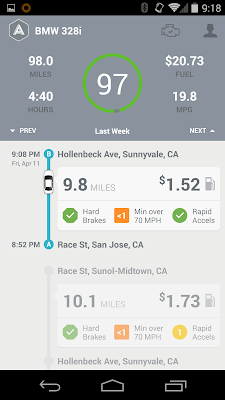 I also get alerted if I accelerate too quickly from a stop, or if I brake too suddenly (though I haven't yet encountered that in my small sample size of use so far). So if I peel out of an intersection, Automatic bleep bloops at me and marks it on my permanent record (so to speak) through the app, so I can feel guilty later. 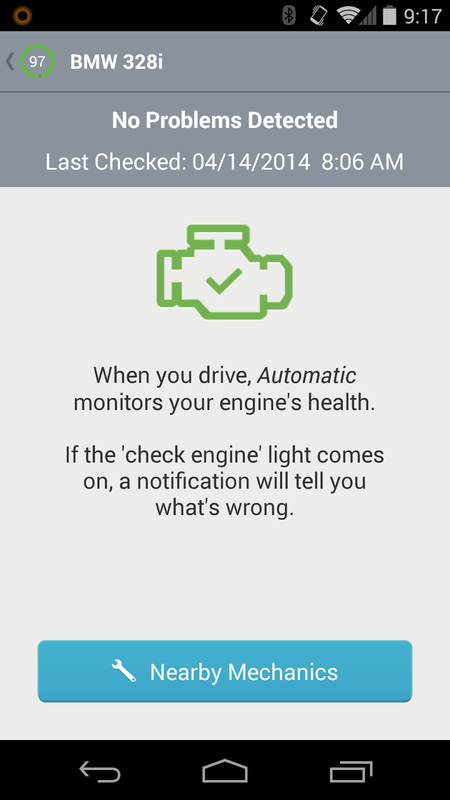 And like any good app that monitors driving, Automatic is set up to be your wingman should any problems arise. 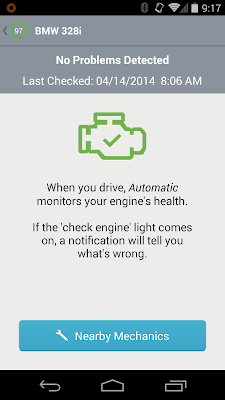 The dongle monitors engine health, and promises to avoid your needing to go to the dealership for repairs if your check engine light goes on, taking away one of life's greatest mysteries. Same goes for the hopefully unlikely chance you're in a crash. Using its crash alert capabilities, Automatic swears it can report any accident to the proper authorities, even if you're unable to. I hope to never ever use this feature, but any added value in my book is a good thing. So what of my trips? I haven't taken the car out for a long drive of any massive length since getting started. As I found when I started using Fitbit and later, the Nest thermostat and SunRun solar panels, simply having the data in front of me had me thinking about the sources of the data a little bit more. I walked more. I ate less. I turned down the heat and root for sunny days to save me money. To avoid getting yelled at by my Automatic, I find myself hovering around 68-69 miles an hour instead of above 70, so my overall score gets closer to 100. 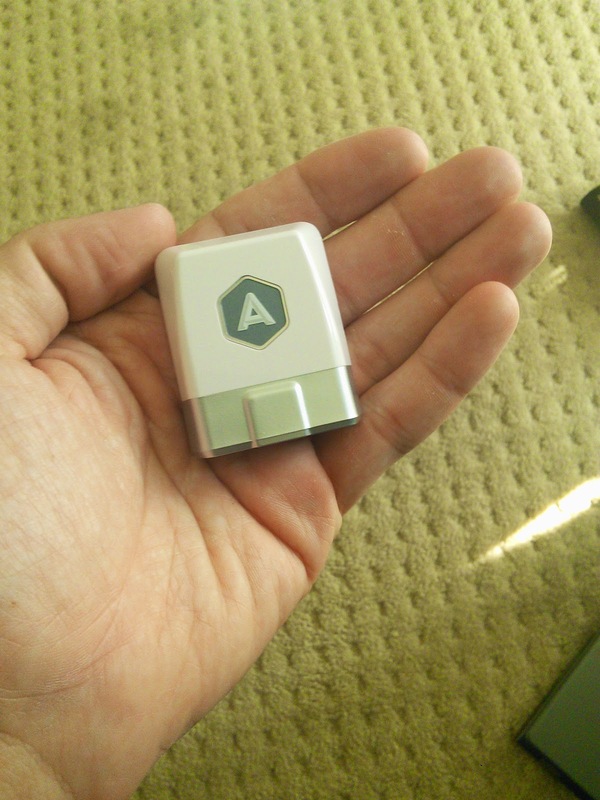 The Automatic Link dongle for your car - not so big. 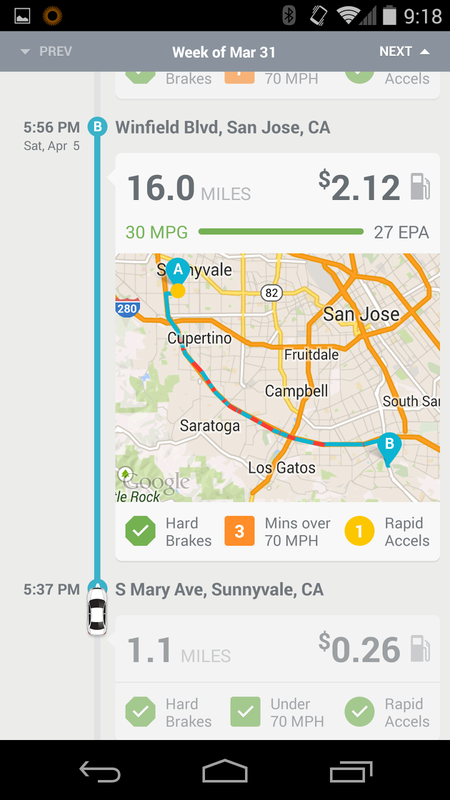 But I'd also like to give Automatic more data - like telling it to alert me if I'm going 10 MPH or more above the posted speed limits, or to set the speed warning at 75 instead of 70, little things that would make the device and accompanying app a little better and more personal, instead of acting like one size fits all. 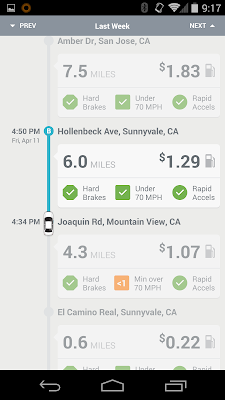 Also, by looking at the data, I found the one time I sustained my speed above 70, on highway 280 here in the Valley, I actually had higher miles per gallon than average. So it could be what's always considered bad, maybe isn't. 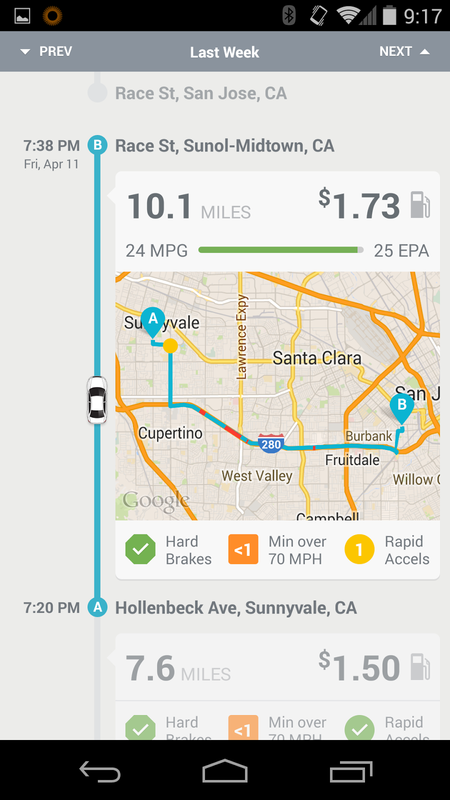 It's early days for Automatic for me, and I'm bullish on the trend of gadgets making us all smarter. So if I can withstand the occasional sharp chirp from my Automatic Link telling me I'm a non-ideal driver, over time I'll get even better. And I'm looking forward to even more data as the sample size increases. You can check out Automatic at https://www.automatic.com/. What's The Approved and Accepted Way to Make Money? There's been a lot of talk about money lately here in the Valley, it seems. Whether it's a product of the exceptional $19 billion acquisition of WhatsApp by Facebook, Google's $3.2 billion Nest buy, the IPOs of Twitter and Facebook, sky-high valuations of private companies, or a real and growing gap between the 1% and the rest, discussion of venture funding rounds and money often appears to be as big a conversation point as the products and innovation that's made this place unique. As my colleague +Scott Knaster often notes in his blog "Witless to History", he and I are good examples of the typical longtime Silicon Valley employee - people who have been close to the action, but never quite in the center of it. No acquisitions to our name. No multi-million IPOs. But it's not necessarily a lack of effort on our part. As I wrote nearly five years ago in "Good People, Bad Companies", one typically needs both skill and luck to deliver a dramatic change in life status. Great employees work for mediocre companies, and mediocre employees are sometimes rewarded handsomely for being in the right place at the right time. So I posited the question, if we celebrate our financially successful entrepreneurs, what about those who've toiled away with similar effort for similar amounts of time, but never got that financial windfall? And in the reverse, what about people who have made quite a bit of cash, but didn't go the textbook route? 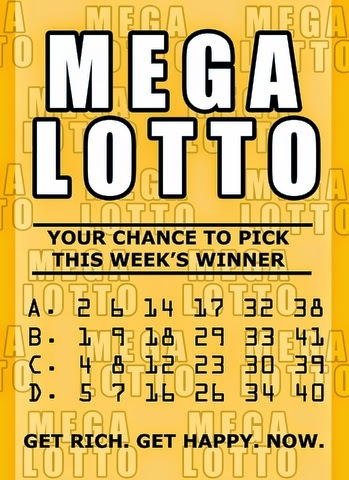 What if a person who had put in an honest day's work for an honest day's pay, got lucky by striking it rich on the Lottery and, instead of making $20 million via some acquihire, they made $20 million by picking the right six numbers? Is that someone who should be held in the same level of esteem? What if their "Poor Aunt Hortense" passed on and left them some money, or what if they correctly saw that marijuana related stocks were going to go nuts on the NASDAQ this January, and they made ten times their money? Would they be congratulated? Silly questions, maybe - but not any more silly than writing posts about how Box CEO Aaron Levie has a "small" position of around 4 to 5% of his white hot company. If we are at the point now where having single digit percentages of stock of a company worth billions of dollars is to be mocked, I too look forward to being mocked in the same way. It seems to me that while we recognize the true value of an individual extends well beyond their bank account, the entire plot of which companies are raising funds, which funds are raising rounds, which companies are valued at what, and which people made cash is outstripping the story behind why some of them are making money. The technology that many of these newly rich people have invented or impacted is changing people's lives for the better - be it in connecting people around the world, saving energy, or keeping memories safe forever. They're taking risks and solving problems that are hard - and that dedication is being rewarded. And that should be okay - as should the rare soul with the mathematical chops to make it big in the professional poker world (it's super duper hard), or the guts to pick stocks worth less than a penny, and see potential. If you do it right, consistently, why not reap in the rewards? What I think we risk by acting as commentators on what people make as much as we are commentators and users as what people actually create, is that we start to reinforce a false mantra that those with greater wealth are those with greater worth. People who do exceptional things have been compensated at exceptional levels for a long time, be it in business, sports or entertainment. And there are no guarantees. As I wrote back in August, it can take an equity event (or two) for an entrepreneur to even afford to stay in the Valley, so you're seeing people play Frogger on LinkedIn, moving from hot company to hot company, hoping to stay on the right one that helps them leapfrog tax brackets. The 20th hire at a multi-billion dollar acquisition will always make more money than the co-founders of a non-profit, no matter how hard either of them works. That they ensured the financial well being of their family, possibly for generations, is to be lauded. But it doesn't make them better human beings. It's important for us to not lose sight of those for whom there are other goals, or for whom luck has not always been there. It's very hard to win the Lotto. Disclosures (per usual): Google owns Nest. I own Nest products. I'm not great at poker, but wish I were. 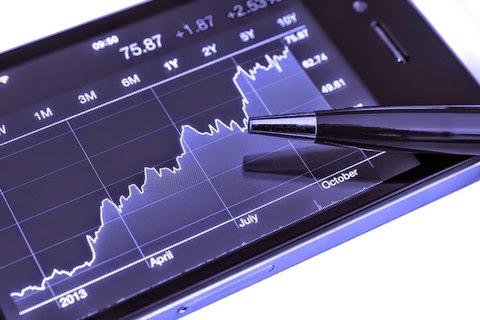 I do play the stock market, sometimes even those penny stocks - because, why not.